United Soccer Coaches released its All-Region Teams on Monday and three Gustavus men’s soccer players were named to the All-North Region Teams. Forward Matt Gibbons (So., Minneapolis, Minn.) is on the First Team, forward Arthur Parens (Sr., Wayzata, Minn.) is on the Second Team, and keeper Anders Severson (Sr., Woodbury, Minn.) is on the Third Team. 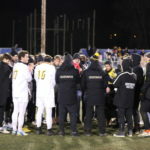 The Gustavus men's soccer team fell to Dominican University 2-0 in the opening round of the NCAA Tournament. 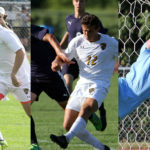 Three Gustavus men’s soccer players were named MIAC All-Conference Friday morning, another four were tabbed honorable mention, and first-year coach Tudor Flintham was named Coach of the Year. 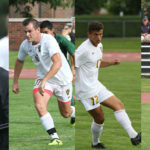 Forwards Matt Gibbons (So., Minneapolis, Minn.) and Arthur Parens (Sr., Wayzata, Minn.), and midfielder Scott Heinen (So., Aurora, Ill.) represent Gustavus on the All-MIAC Team. The Gustavus men’s soccer team is set to compete in the NCAA Championships Saturday as it takes on Dominican (Ill.) in the first round, hosted by Luther College in Decorah, Iowa. The Gusties and Stars kick off at 5:30 p.m., which follows Luther vs. Knox at 3 p.m. The two winners face each other at 5 p.m. Sunday. 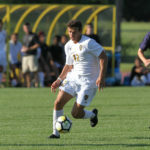 The 2018 College Sports Information Directors of America (CoSIDA) Google Cloud Academic All-District Men’s Soccer Teams are released and Gustavus junior Luke Laurich (Batavia, Ill.) is named to the 12-member District 6 Team, which features student-athletes from institutions in Michigan, Minnesota, and Wisconsin. 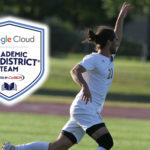 The Google Cloud Academic All-District Teams recognize the nation’s top student-athletes for their combined performances athletically and in the classroom. 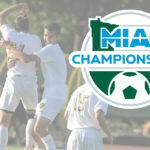 The Gustavus men’s soccer team Monday was selected as an at-large bid to the NCAA Championships. The Gusties, winners of the MIAC regular season championship, will compete in the Decorah, Iowa Regional, hosted by Luther and will take on Dominican (Ill.) in the first round on Saturday at 5:30 p.m. 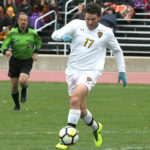 The Gustavus men’s soccer team was upset in the MIAC semifinals by Augsburg 1-0 on Wednesday afternoon at the Gustie Soccer Field. The top-seeded Gusties outshot the No. 5 Auggies 18-2, but were unable to find the back of the net in a season-ending loss. After winning its record 15th MIAC regular season championship, Gustavus finishes the season 14-3-1. The Gustavus men’s soccer team is set to host Augsburg in a MIAC semifinal match at 2 p.m. Wednesday at the Gustie Soccer Field. The No. 1 Gusties earned the MIAC regular season title with an 8-1-1 record and are 14-2-1 overall. The No. 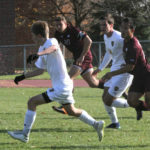 5 Auggies (12-3-2) advanced to the semifinals by defeating St. Thomas in penalty kicks today. The Gustavus men’s soccer team Saturday added to the storied legacy of the program, earning its record 15th Minnesota Intercollegiate Athletic Conference championship with a 1-0 overtime victory at Macalester. It’s the first regular season title for the Gusties since 2013 as they complete the 2018 MIAC season 8-1-1. It all comes down to the final match of the season with the winner taking home the MIAC championship. The Gustavus men’s soccer team travels to Macalester for a 3:30 p.m. match Saturday with both teams boasting 22 points in the conference standings at 7-1-1. The Gusties, ranked No. 1 in the North Region, are 13-2-1 overall, while the Scots are 10-4-3 on the season. Gustavus is seeking its first MIAC regular season championship since 2013.